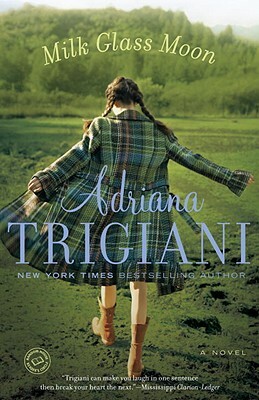 Milk Glass Moon, the third book in Adriana Trigiani's bestselling Big Stone Gap series, continues the life story of Ave Maria Mulligan MacChesney as she faces the challenges and changes of motherhood with her trademark humor and honesty. With twists as plentiful as those found on the holler roads of southwest Virginia, this story takes turns that will surprise and enthrall the reader. Transporting us from Ave Maria's home in the Blue Ridge Mountains to the Italian Alps, from New York City to the Tuscan countryside, Milk Glass Moon""is the story of a shifting mother-daughter relationship, of a daughter's first love and a mother's heartbreak, of an enduring marriage that contains its own ongoing challenges, and of a community faced with seismic change. All of Trigiani's beloved characters are back: Jack Mac, Ave Maria's true love, who is willing to gamble security for the unknown; her best friend and confidant, bandleader Theodore Tip-ton, who begins a new life in New York City; librarian and sexpert Iva Lou Wade Makin, who faces a life-or-death crisis. Meanwhile, surprises emerge in the blossoming of crusty cashier Fleeta Mullins, the maturing of mountain girl turned savvy businesswoman Pearl Grimes, and the return of Pete Rutledge, the handsome stranger who turned Ave Maria's world upside down in Big Cherry Holler. In this rollicking hayride of upheaval and change, Ave Maria is led to places she never dreamed she would go, and to people who enter her life and rock its foundation. As Ave Maria reaches into the past to find answers to the present, readers will stay with her every step of the way, rooting for the onetime town spinster who embraced love and made a family. Milk Glass Moon""is about the power of love and its abiding truth, and captures Trigiani at her most lyrical and heartfelt.